According to City-data.com the median sale price of a home was about $425,000 in the 1st Quarter of 2014. Zillow.com reports the price to be lower at $401,200 for the same period. There are retirement communities in Hanover, (see link at right). 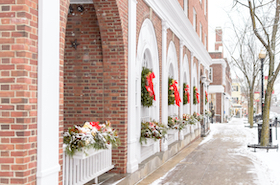 Hanover is a small town with a great Ivy League school as the heart of the community. Dartmouth offers courses and lectures for seniors; Hanover is considered a Trail Town as it welcomes Appalachian Trail hikers offering them showers, laundry facilities, and dinner one night a week; The Connecticut River, along with the White and Green Mountains host recreational activities for every season; the town has an active Senior Center which sponsors activities and social events on a weekly basis; Hanover has a low crime rate and is a walkable community. The winters in Hanover are snowy and cold; the cost of living is very high; it is in a remote location with the nearest large airport a couple of hours away (Boston). The median age of the population is very young, which some retirees may not like. Hanover experiences cold, snowy winters with an average snowfall of about 62 inches and an average January temperature of 22 degrees. The average July temperature is 70 degrees. With the presence of Dartmouth in Hanover, there are several opportunities for residents to enjoy the arts, college sports, and different dining choices. The Hood Museum of Art at Dartmouth College is a teaching museum and is one of the oldest and largest college museums in the country, with collections dating back to 1772; Dartmouth’s Baker-Berry library is open to the community and host many permanent and rotating exhibits; The Hopkins Center for the Arts, also on the campus, presents an array of music and plays throughout the year; The Montshire Museum of Science is a hands-on museum located in nearby Norwich, Vermont, with more than 140 exhibits relating to the natural and physical sciences, ecology, and technology. The building is located on a 110-acre site near the Connecticut River, and it’s outdoor environment is a large part of the visitor experience. Hanover has a low crime rate, about half the national average. Dartmouth Hitchcock Medical Center is in Lebanon, about 3 miles away. Lebanon Municipal Airport is about 11 miles away and is serviced by Cape Air; The closest large airport is Boston International Airport which is about 130 miles away; Amtrak services White River Junction in Vermont, approximately 5 miles from Hanover.